Key difference: The two paper sizes are used for different purposes in different countries. A4 paper is part of 'ISO 216-series' , while the Letter paper is a part of the old 'American National Standard Institute'. 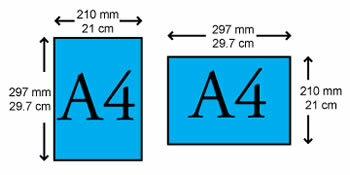 A4 is an internationally recognized paper size that measures 8.27 inches wide and 11.69 inches tall. All “A” sizes has an aspect ratio of 1: √ 2 (square root of 2). It is observed that this ratio was implemented to achieve perfection in the paper sizes. The A4 size papers are used as the classic paper sheets in all industrialized countries. 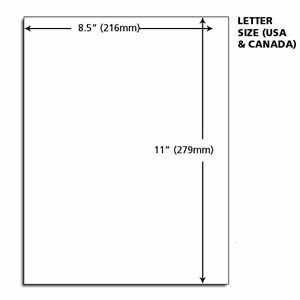 Letter or US Letter is the most common paper size used for official purposes in the North-American countries. They are also known as “American Quarto”. These papers are slightly wider and shorter than the standard A4 size. They do not consist of any ratio format. The letter paper works in similar formats, as that of A4 papers. It is assumed that the letter sized papers may not survive in the future globalization due to their complex size formats. It is a standard size of typing paper adopted by the International Standards Organization (ISO). It is a Non-ISO size typing and printing paper used almost exclusively in the US and some neighboring countries. It is officially called as the A-size papers. They are defined by the ISO formal standards. It is defined by American National Standards Institute (ANSI). Australia, New Zealand, UK and many South American countries such as: Mexico, Costa Rica, Chile, Venezuela, etc. Letter sized are used in the countries like: United States, Canada, Mexico, Bolivia, Colombia, Venezuela, the Philippines and Chile. Dr. Porstmann of Germany published a document proposing a standard for paper in 1920. Ronald Reagan made this the paper size for U.S. federal forms in the early 1980s. It first came into use around 1921. They are not an arbitrary type of paper. They are arbitrary type of paper. They are easy and understand to work. They are a little complicated to work. Their aspect ratio does not follow any such properties. The area of the A4 is slightly bigger than that of Letter by 0.002 square meters. They are of smaller areas compared top the standard A4 size papers. They are commonly known as the A-series. They are known as ANSI A or American Quarto. They are used for letters, magazines, forms, catalogs, laser printer and copying machine output. They are used for official purposes.